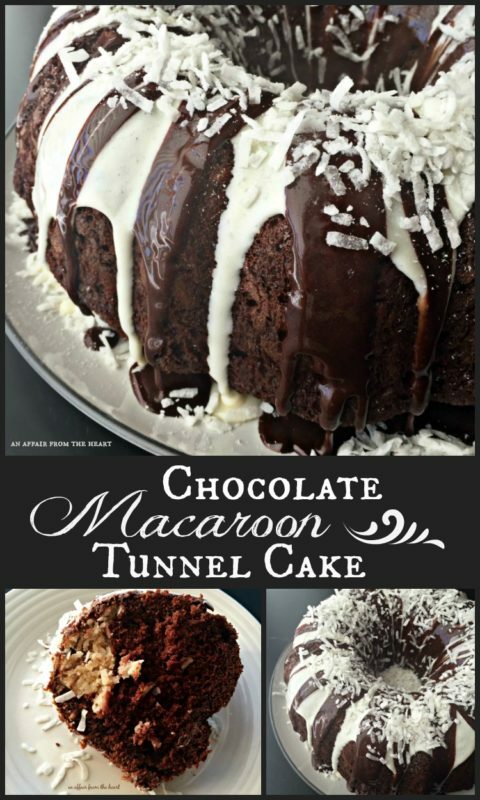 Chocolate Macaroon Tunnel Cake - Just like the old box mix! 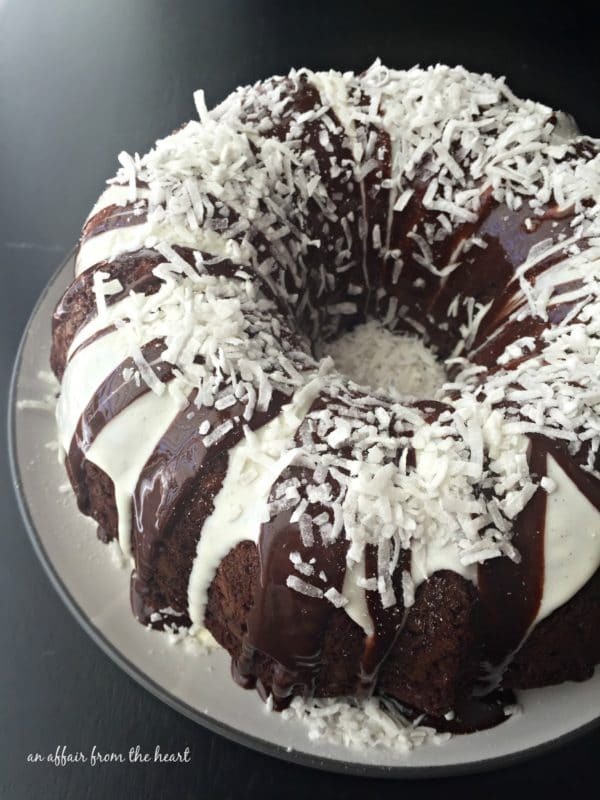 Rich chocolate bundt cake with a coconut tunnel inside. Drizzled with both chocolate and vanilla icing. Just like that age old mix time forgot. I originally posted this recipe in October of 2011, although the process of perfecting this cake took years before that. I decided it was time for this to be re-posted, as the pictures I had way back when certainly didn’t do this cake justice. So, before I share the recipe with you, let me tell you how I went about trying to make this cake. Twenty-Five years ago, at one of my bridal showers, my Aunt Carol gave me my first bundt cake pan. She had remembered Brian saying how he loved a cake made by Pillsbury, called a Chocolate Macaroon Tunnel Cake. She had slipped one of the cake mixes inside the bundt cake pan. Well, back in the dark ages when we got married, and the cake was ripped from the grocery shelves, Google wasn’t even born yet. It wasn’t like today when you can just hop on your smart phone and whatever you want is literally at your fingertips. Once google was born, I started trying recipes that said they tasted like the old box mix. and guess what?? I had it!! So, now that I have done all of the trial and error for you, you can have this age old cake that I have had SO MANY tell me “used to be their favorite, until it was gone.” Enjoy! Pour about ½ of the cake mix into your bundt pan. (see photo in blog post) Now spoon filling in a "tunnel" on top of the batter. Be careful not to let the filling touch the pan. Now pour and evenly cover the tunnel with the rest of the batter. This photo shows how to scoop the coconut mixture into the cake. Oh Wow! That looks and sounds so rich and delicious! I’m in love with this cake!! 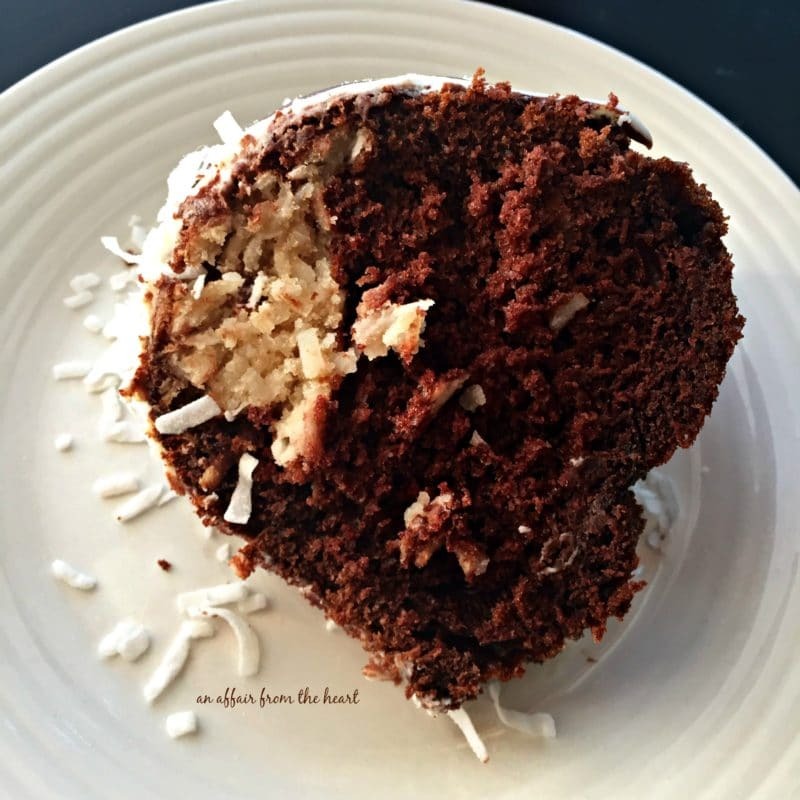 Chocolate and coconut are two of my favorite things so seeing them together makes me hungry! This is beautiful! I think it’s a show stopped, and a must make! What a great cake for Christmas! I can’t say enough about how beautiful it is. I’m really glad you reposted it! This cake is gorgeous! 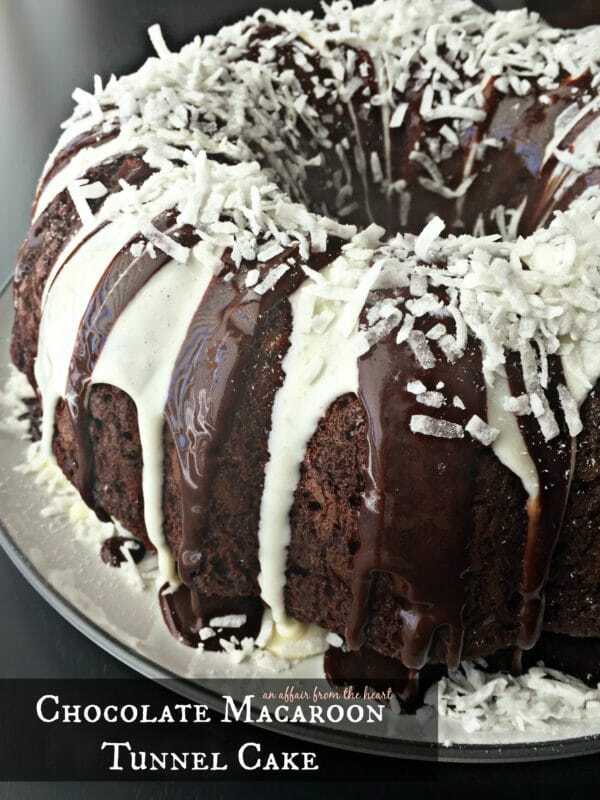 In my opinion, chocolate and coconut were meant to go together, so I’m sure it tastes amazing, as well! This is one of my favorite cakes, ever. It’s not only perfect for the holiday season but also for any special occasion or just to celebrate life. I agree with everyone else, chocolate and coconut were made for each other! Fantastic job, yet once again!!! This is one beautiful cake. It looks like a work of art and sounds delicious! Perfect for the holidays and entertaining! This looks so good! 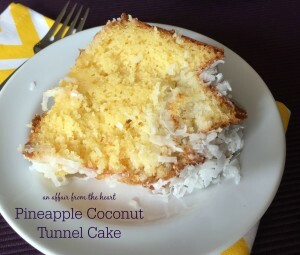 Love that tunnel of coconut for some extra coconuty flavor! I can’t say enough about this cake. I love mounds and almond joy candy bars so this is right up my alley. It is stunning and I think I might have to make two of these because I am going to eat a whole one myself! This sounds amazing! I dont think theres a chocolate cake out there that I didn’t love. Cant wait to give this one a try! this looks phenomenal! 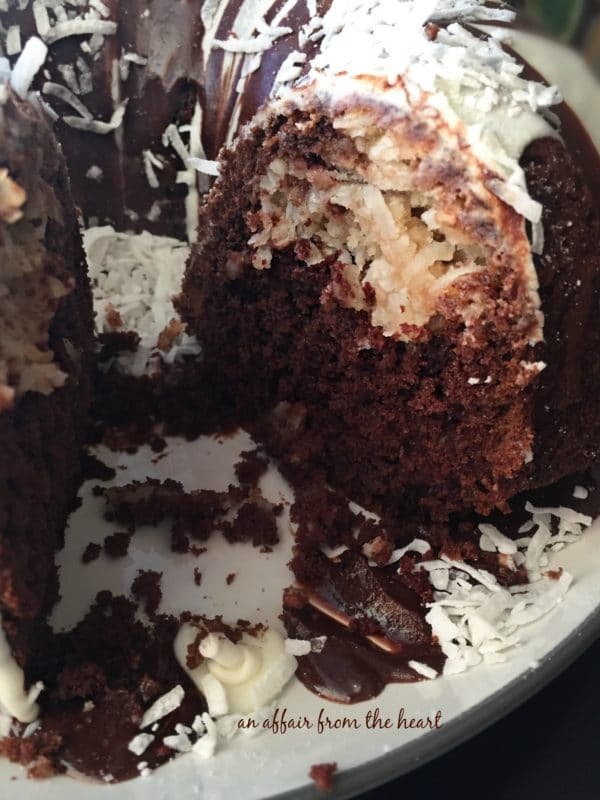 chocolate and coconut FTW! It might only be 7am right now but I could seriously go a great big slice of this now! Gorgeous! 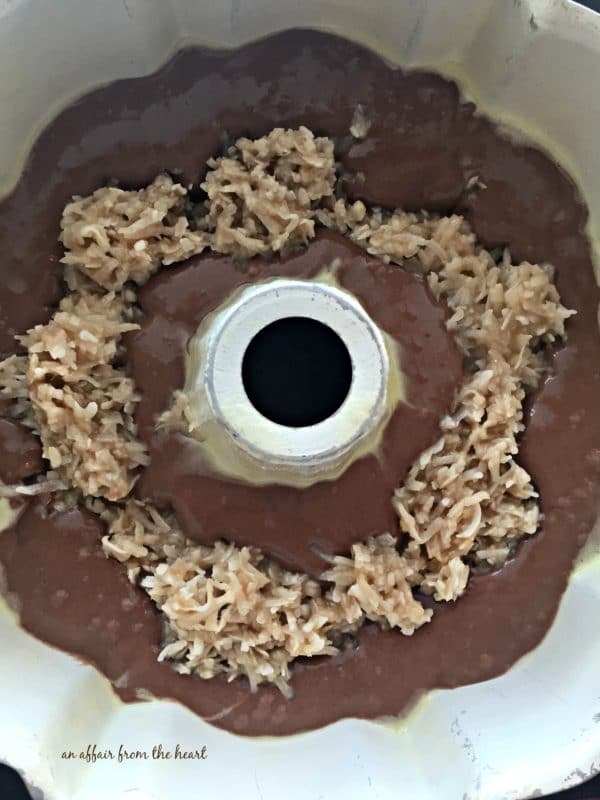 Cacao and coconut! A divine marriage! What a beautiful cake, Michaela!! I know I’m echoing others in saying that chocolate and coconut are wonderful together… Can’t wait to make this cake for my family!! Wow – this cake looks amazing. I love coconut so I know I would enjoy digging into it. I will make this for my mom. 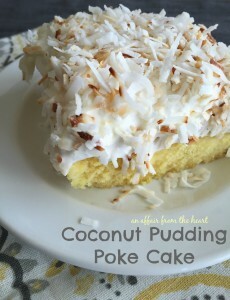 She loves coconut, and this cake looks so impressive. Yum! First off, I love chocolate and coconut! Second, I love a bundt cake because you only have one pan and no layers to get right! For ingredients, is the flaked coconut unsweetened? I would think so, since you are adding sugar to the filling. 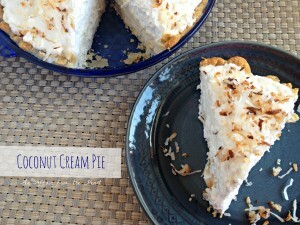 I have sweetened flaked coconut, so I’m trying to figure out how to adjust the sugar. I always use sweetened coconut. It’s not overly sweet for us, but you can adjust if you want! You say to drizzle with frosting if you desire. Well the topping you made in the pictures is a huge part of the appeal of the cake! I’ve never frosted a cake before. I don’t know what to do to make it look or taste as good as yours. Could you please add instructions for this? Pretty please?! Danielle – I am sorry! I shouldn’t assume! Honestly, I usually buy a can of chocolate and a can of vanilla frosting. I heat about 1/2 cup of each in the microwave for a few seconds to get it to where it pours easily. (not soupy!!) 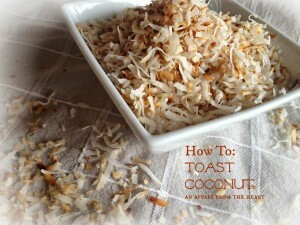 Start with one and then overlay the other, dust it with sweetened coconut flakes to finish it off. I hope that helps!